What is “art,” and who is an “artist,” and who are we to judge what art is “worth”? Is the wind as it shapes the plains, arranging its verdure according to its whims, not in its own way an artist? Is Batman Forever not “art”? And if the man who starred in Batman Forever should pluck a prickly bush from the ground and dip it in gold, is this not worth $150,000? 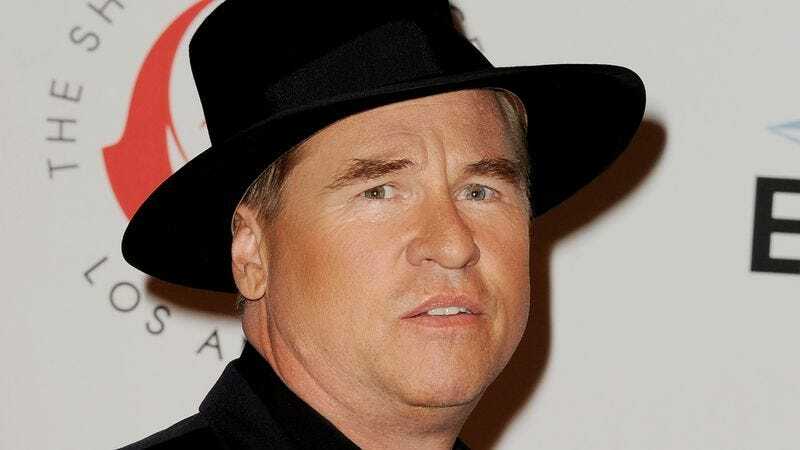 All are questions to contemplate as you gaze upon the peaceful, non-rolling “Tumbleweed” that’s currently being sold by Val Kilmer. The actor doesn’t just preach a manifesto of “Make more art;” he actually goes out there and finds the shrubs to bronze in 22-karat gold and do it. And now you can add that art to your personal collection by purchasing it through the L.A. luxury boutique Just One Eye. “Don’t forget Christmas is just around the corner!” Kilmer reminds via his Facebook page. Indeed, imagine your significant other’s face as they find this beneath a comparatively paltry, non-gold-dipped tree, as you explain that it was made by the star of Top Secret! and you paid a little more for it than you would have a Maserati. Of course, even Kilmer himself admits he’s “slightly embarrassed” by the price of his shiny plant—but hey, it cost him a “pretty penny” to make. Besides, you’re not just paying for the materials, or for a big gold tumbleweed: You’re paying for the story it tells, with the tumbleweed symbolizing both Kilmer’s childhood in New Mexico and his grandfather’s past as a gold miner. There’s also the obvious nod to Kilmer’s role in the classic modern Western Tombstone, as well as the ironic juxtaposition that offers a deeper musing on the impermanence of life—in which we are all like gold-dipped tumbleweeds, so certain we’ll shine forever, only to be tossed asunder by a sudden shifting breeze. The truth is we can only roll across the lonely, desert expanse of this world, and maybe try to sell some stuff with our name on it. But if that kind of existential revelation and $150,000 is too rich for your blood, Kilmer’s also selling a piece of metal that he painted “I TICKLED LOU REED ON” for just $3,600.